There are two things in my bag that I am forever digging for – keys and purse. (My cell phone is the third but I have no excuse becuase it is easy to find if I put it back in it’s pouch after I have used it). My solution was to stitch two rings onto the inside of my coffee bags’ shoulder straps (just below the top of the bag). I then added clips to my key bunches so that I could easily clip them on and off and I tied my bird purse using Petersham ribbon (from Ebony & Ivory) to the other ring so that I would not accidentally forget it on a counter top. This method has stood the test of time and is still working wonderfully for me. P.S. I do not add them to the Organic Coffee Shoulder and Sling Bags becuase the metal rings are not organic. However, if you would like them added, please request them in your order and I will happily stitch them on for you. They make my life easier and I am sure they would yours. 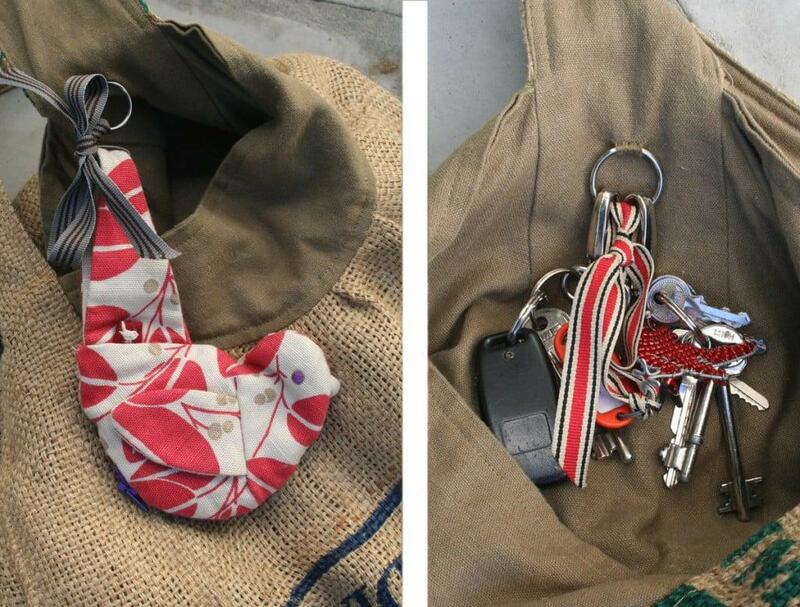 This entry was posted in DIY Projects and tagged bag organise, Bag organising, clip, key ring, keys, organised, petersham ribbon, purse, tip.